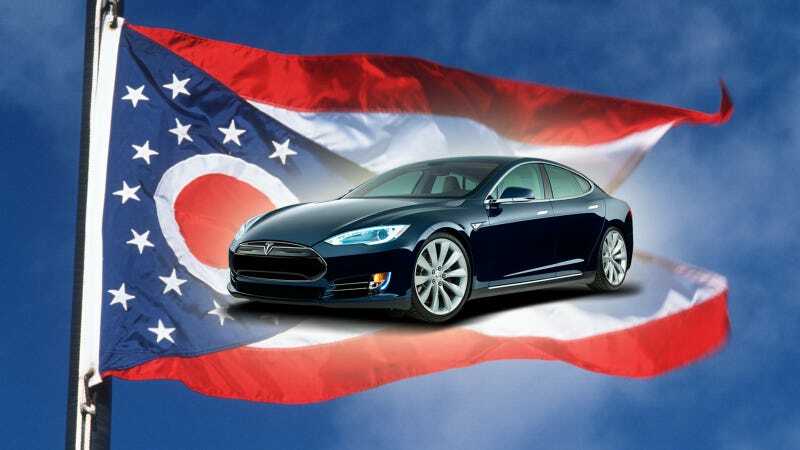 Elon Musk and Tesla Motors 1, Ohio's car dealers 0. The nascent electric automaker scored a win yesterday in a surprise battle over direct auto sales that sprung up in the Ohio State Senate. As you've no doubt heard by now, Tesla wants to sell their Model S and other upcoming cars direct to customers instead of through a third party like a car dealer. The car dealers feel threatened by this, and so they've used their considerable political clout (read: deep pockets) to try and pass or strengthen laws to ban direct sales in states like Texas and New York. The latest fight happened in Ohio yesterday, where the Ohio Dealers Association pushed for an amendment to Ohio Senate Bill 137. That bill is pretty innocuous — it requires drivers to move to the left lane on the highway to avoid maintenance vehicles on the side of the road. But the bill came with a rider that, if passed, would prevent "a manufacturer or a subsidiary, parent, or affiliated entity of a manufacturer" from selling a vehicle in the Buckeye State. Naturally, Tesla called on its supporters to reach out to their elected officials in Ohio and speak out against the bill. It must have worked. According to Green Car Reports, the amendment was struck down yesterday, and the unamended SB137 passed unanimously. Yesterday, in a blow for capitalism and common sense, the Ohio House declined to attach the amendment to the bill. For the moment, Tesla is free to open dealerships there, but the battle isn’t done. The legislature wants to look at the issue in greater depth again next year. But in Ohio, existing franchise law made that leap impossible. The only reason an anti-Tesla law was needed was because the company had no existing dealerships to compete with. GM, Ford, or Audi already couldn’t open a corporate-owned dealership in Ohio whether or not the new law passed. But that didn’t stop Rhett Ricart, owner of a dealership in Groveport, Ohio from hyperbolically declaring: “Tesla is Armageddon” and insisting the legislation was needed. Emphasis mine. Clearly, car dealers in Ohio and every other state aren't going to take this lying down; they fear Tesla could open the floodgates to every other manufacturer performing direct sales, which creates competition and threatens them with irrelevance. Tesla's direct sales are currently banned in Texas and Arizona and are in legal limbo in other states. In Ohio, they have one store in Columbus and may accelerate plans to open more before the legislation re-emerges next year, Forbes says. As I mentioned in yesterday's Morning Shift, Musk's best plan is probably going to be to fight this at the federal level. I have a feeling that will be coming sooner rather than later.